Whenever my grandpa came over to eat, my mother served Potato Pancakes with applesauce. I remember her spending all afternoon grating potatoes for this special German delight, and my grandfather always said it reminded him of the old country. It was definitely a family favorite, and with a food processor the grating chore would now be much quicker, but it’s just something that I never made much until now. 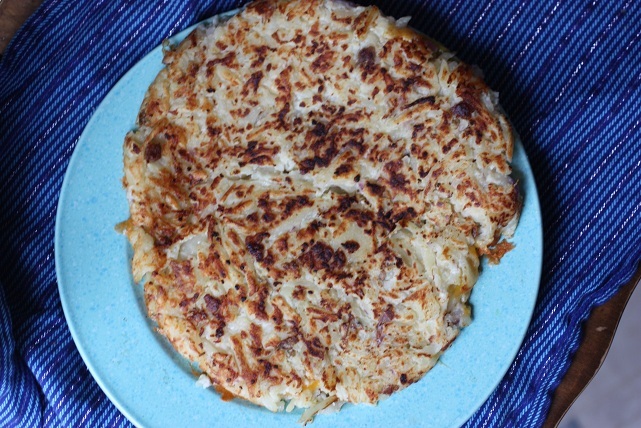 Always looking for ways to cut a step or two, plus desiring to maximize my bulk cooking prowess, this new Potato Pancake adventure is something that I have mastered. Whenever I bake up potatoes, I purposely make at least ten extras for hash browns the next day. I do a lot of potato and egg skillet breakfasts, and will even make up my own freezer bag hash brown “kits” for quick breakfasts, but they still require me to “man” the pan while they crisp up. Since I had just made extra baked potatoes, I decided I wanted to try something new, a little twist on my mom’s old fashioned potato pancake recipe and this can be made with either left over mashed potatoes or baked potatoes that have been shredded/grated. I ran my potatoes through my 20 year old food processor and shredded them, but using left over mashed are delicious as well. The best part about this new process is that I can whip up the recipe so quickly, grease the pan with my “Grandma’s favorite ingredient,” push the ingredients down into my skillet and walk away. Yes, that’s right. 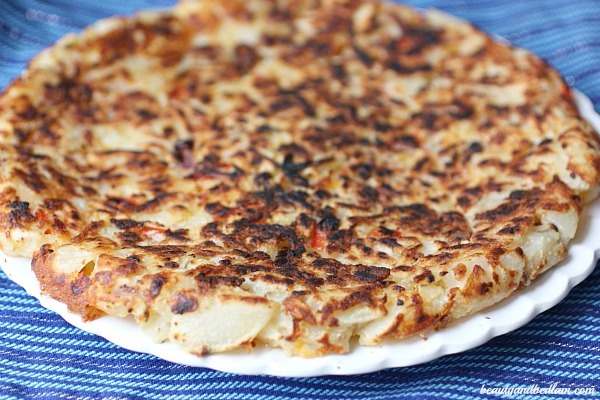 This is a no flip, potato pancake recipe and that is the key to its success. I don’t have to “man” it. It’s hands free. I just made one ginormous Potato Pancake (well, one and then another, and another,) and then cut it into wedges. The first time I made it, I did a very basic, potato with a touch of cheese, only type of pancake. ( See picture above) That is completely exceptable and if you are a plain potato lover, then do not feel you have to add in the extras because it was so yummy just like this, but wow, the extras take it up just a notch. Enjoy, and let me know the “Extras” that your family loves! Combine potatoes, eggs, flour, seasonings and “extras” in a bowl. Heat oil in a skillet over medium-high heat; put potato mixture in skillet, pressing with a spatula to flatten evenly and then fry. Sprinkle a little additional cheese on top, if desired. Cover and cook until bottom is crispy, about 10 minutes. oh, I think I’ll just have to try this. We have a baked potato bar every Sunday after church. We put our potatos in a roaster oven with some water and when we get home they’re done. I always make extra for breakfast also. I think I’ll make these right now…. I just made these for lunch using raw shredded potatoes. Worked great! 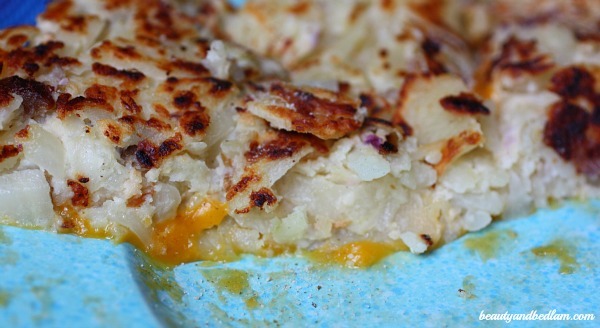 No need to wait for leftover potatoes to make it. The only way this recipe would serve six people, though, is if it were a snack or served w/ lots of other things. I doubled your recipe and four of us finished it off. Thanks for the idea! Yes, I will go clarify serving size. When I made it, I doubled and then doubled again. 🙂 With those measurements, it’s more just a potato pancake as a side. Glad to know that it worked fine with raw, shredded. That is how my traditional recipe works, but it just takes a bit longer to fry up. Oh my goodness! That looks delicious! I think potatoes are one of the best parts of breakfast! This looks great, love you don’t have to flip it! 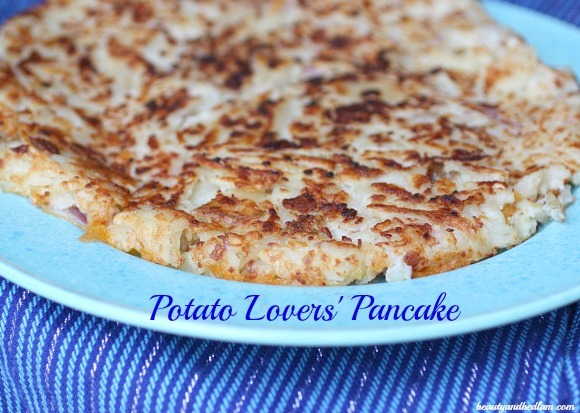 the BEST way to have potatoes for breakfast!! Oh, yes please! I want this with a couple eggs and bacon! !